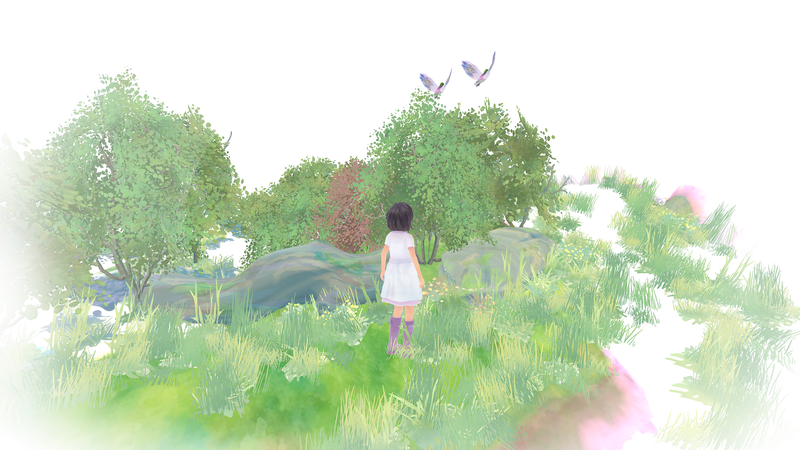 During Rezzed I was constantly amazed by the fantastic games on show, but I don’t think any of them struck me as strongly as Beyond Eyes, developed by Sherida Halatoe and Team17. If the latter name sounds familiar, they’re the studio behind extremely funny the Worms series. But what they had wasn’t a zany free-for-all between grubs, but a beautiful, serene and somehow both heartwarming and heartbreaking game. 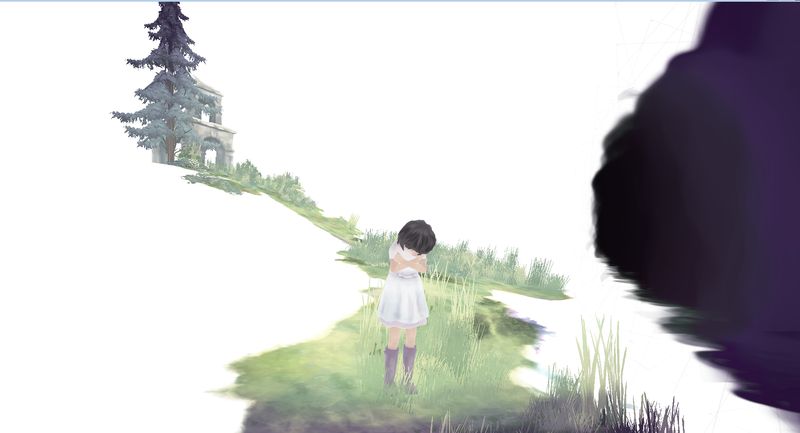 Beyond Eyes puts you in control of a little girl, Rae. According to the developers I interviewed, she lost her sight at early age and became something of a recluse, just staying inside her house and her garden, the places she knew, where she was comfortable. But then one day a funny little cat showed up and stayed with her, becoming her new best friend. (Image Credit: Tiger & Squid) Dont’t worry Rae, we’ll get you out of the bad places! But then he left and that’s where the story and the game begin, with her leaving her home, her comfort zone and into the big world to look for her lost cat, Nani. When you play, you see only Rae and the spot she’s standing in. Everything else around is pure white emptiness. As you explore, the world emerges and brings colour to the emptiness, showing you the beautiful landscapes she’s exploring. The visual style is reminiscent of watercolours, and the developers chose it because they wanted to mimic the way they spread when water or another colour drops into them, how it ripples outwards. 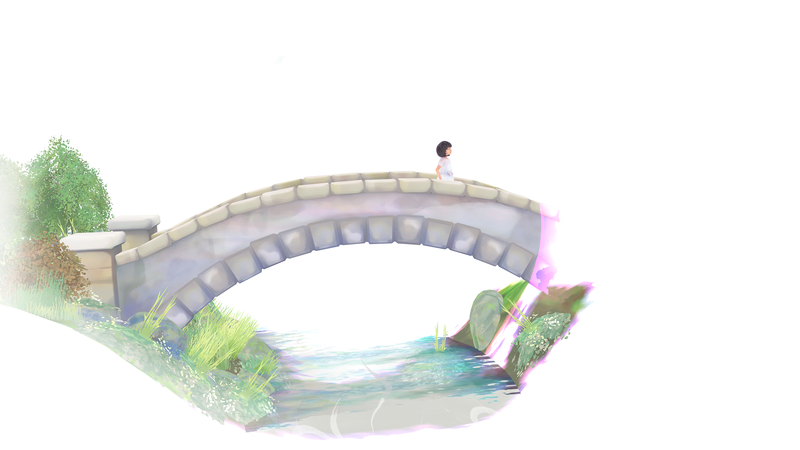 In Beyond Eyes, the world reveals itself in ripples as you explore and it’s breathtakingly beautiful. At first, the little girl will walk slowly, hugging herself tightly, afraid of the world around her. But as you keep moving she’ll relax, spread her arms and let herself feel the world with her other senses. Green swirls in the air mark places of interest for her sense of smell, from flowers you can pick up to a place where you friend the cat passed by. Sound in particular is very important, as it tells you where to go, giving you landmarks to reach. The earliest of these is a bell in the distance and your exploration is all about reaching that spot. But your senses can sometimes lead you astray. The sound of clothes rustling in the wind that at first showed itself to me as clothing drying on a clothesline—what she imagined they were—turned out to be a scarecrow with baggy attire surrounded by mean crows. During these encounters, she’ll get scared and hug herself again and I had the sudden urge to rush her out of that bad place, so she might once again have the confidence to walk around and take in what the world had to offer. I felt protective of this little girl and I had just been guiding her for minutes. Beyond Eyes made me care for a character with only a few minutes of interacting with her. (Image Credit: Tiger & Squid) This is just gorgeous. Jaw-droppingly so! I asked the developers how that confidence worked. They said that when scared she’ll focus much more strongly on the bad things, making you lose valuable sensory cues. In my case, it stressed me out and I wanted to get out of the bad places as soon as possible. The demo I played had only the first chapter, which is the area around her house. It ended when she came to a crossing, represented by a wall of black smoke. As we approached it, she became frightened of the rumbling noise. Thankfully, there was a sound cue not far off. It was a woodpecker on a traffic sign pole with a pedestrian crossing button. When Rae pressed the button the cloud parted and she moved on to keep looking for her friend. But before I crossed, I looked back over the landscape I’d just help paint and it was astonishing: lush hills, filled with beautiful flowers and grazing cows. At one point, I picked up some flowers and gave them to a nearby cow as a snack. I don’t know what it did mechanically, but I do know I was smiling as I did it. (Image Credit: Tiger & Squid) As you explore you paint the world on this white empty canvas. When I set the controller down, I wanted more. Thankfully, the game is coming later this year for PC and Xbox One. This is a gorgeous game and one I recommend you all get if you can. For PS4 owners, don’t worry, there’s still a chance you might get it as well.